Preheat oven to 425°F. Line two baking sheets with parchment paper and set aside. In the bowl of a stand mixer, combine flour, 2/3 cup sugar, salt, baking powder, ground ginger and baking soda. Add butter gradually, softening between fingers before blending into batter. Mix until a coarse meal forms. Add pecans and 1/4 cup crystallized ginger. In a separate bowl, whisk most of the buttermilk (leave about 1 tbsp aside for later), grated ginger and vanilla. Form a well in the center of the dry ingredients and pour in buttermilk mixture. Mix until just combined and the dough is shaggy. Using an ice cream scoop, scoop out a generous amount of dough and place on baking sheet. You should have about 12 scones once all the dough is scooped. Brush the tops of the scones with remaining buttermilk, 1 tbsp sugar and 2 tbsp crystallized ginger; press to adhere. Maybe you really, really like pecans. Maybe you just can’t get enough of ginger. 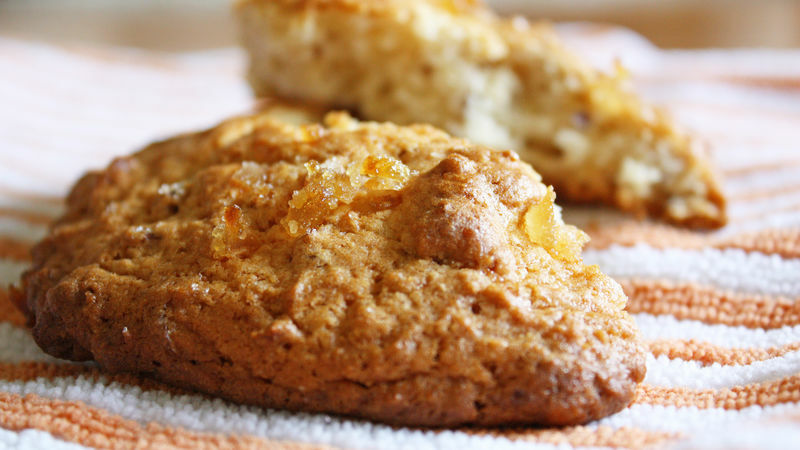 In either case, these Ginger Pecan Scones are most definitely for you! These scones – or as I fondly call them, “scookies,” after they came out of the oven shaped like giant, round cookies – are not for the flavor-timid. They pack a wallop of ginger flavor with a triple-threat of ground ginger, crystallized ginger (my favorite) and fresh grated ginger. Combined with the crunchy texture and mild, nutty taste of chopped pecans, each bite is an even, mellow medley of both flavors throughout the scone, so you won’t find a random punch of ginger or pecan or butter in any bite. They all work together in harmony. These scones are also delightful and unique because they’re incredibly soft – not crumbly, dense or dry, like most other scones. But they still maintain that delicious buttery taste. They’re also really quite pretty to look at, with glittering orange gems of crystallized ginger speckled across the top. And they’re super easy to make – just mix the ingredients together, scoop the dough onto baking sheets, and bake until done. In less than an hour you’ll have breakfast and your kitchen will smell magical. If you want your scones to look a little less cookie-like, I’d suggest adding more flour to the dough until it’s just manageable enough to hold in your hands without sticking to your fingers. But by adding more flour you’ll run the risk of these scones getting tough – the choice is yours. The bottom line is: You pretty much need to make these as soon as possible!